Couldn’t be happier with this bench. I put it under my double window in the great room for extra seating but let’s be honest, it’s really for the cats to look outside and birdwatch. If you’re looking for beige this might not be right for you. It is definitely more brownish/gray than beige and the wood is darker than it appears in the picture which actually works great with my decor. Product is very sturdy and came fully assembled. I love it! 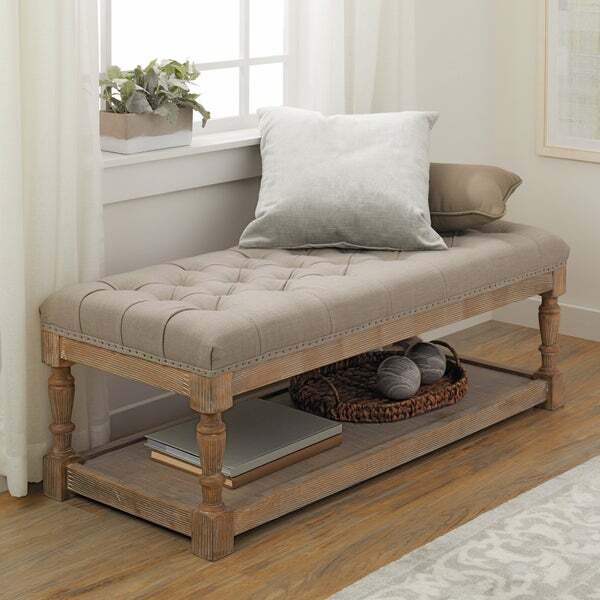 Enhance your home and living decor with this uniquely styled and crafted beige linen tufted bench. Soft and durable linen fabric covers this unique piece of furniture in combination with a solid wood framing featuring a meticulously reclaimed finish, bringing comfort and warmth to any setting. Avoid placing your furniture in direct sunlight and maintain at least two feet between furniture and heat sources. Use a professional cleaner to help resist staining and prevent overall soiling. For oil-based stains, use a professional degreaser. First off, i LOVE this bench. its a gorgeous piece, however, it is NOT as descripted as beige. its more of an army green/dark grey color, which does unfortunately does not mesh with any of my decor. We bought this to fit as a coffee table in a small, awkward space in our living room, and it's perfect. As other reviewers have said, it's more of a gray than a beige, but that is exactly what we were going for. We love the combination of the gray fabric and the distressed wood - we couldn't be happier. In love with this bench. As one reviewer mentioned, it is more gray then beige which is perfect with our other furniture so this was not a deterrent. I will note that I gave it 4 stars instead of 5 because it was not packaged very well. There was only padding/protection on the top portion and our bench was partially damaged during shipping (there were 2 holes in the box when it arrived) on the underside of the bench where there was no padding/protection. We decided to keep the bench as the damage was minor and not very noticeable but it was disappointing. Bench is gorgeous, everything we were looking for. 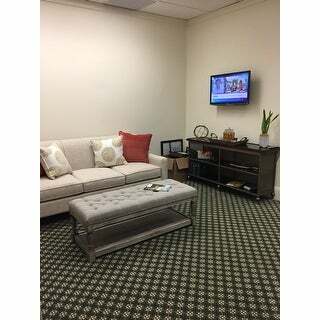 It does have gray undertones but works perfectly in our space. It comes assembled which is a major plus. The bench is very sturdy, very heavy and solidly made. We are using it as an entry bench and the size is perfect. The linen is a very high quality fabric and the bench is an overall 10/10. I would definitely purchase this bench again. Great item overstock!! Absolutely love this bench. It's a very well made bench for the price. The weathered oak finish is beautiful along with the linen tufted upholstery and nailhead trim. Super sturdy! The material is a perfect blend of sophistication and natural texture. I really love the firmness of the cushion and have found several places to utilize this versatile piece. Well made, exactly what I have been searching for! I use it at the foot of the bed to help the dogs get on &amp; off the bed, it is very sturdy and doesn't rock from their 100# four legged bodies. Also, as stated by others it is a beautiful soft gray linen. Great bench! Pretty true to color, a bit more gray/taupe, but blends with so much! Love it! Beautiful. I agree with the other reviewers that this bench is a little more grayish than the picture, but that was exactly what I was looking for. LOVE this bench!! I'd read some reviews that said it was more grey and I would say it's pretty true to color what I saw online. Very sturdy, well built and colors are great! Looks identical to what the photo shows and it's perfect for our entry! I love this bench. I wanted to create built in feeling and this bench measured and fit perfectly. It’s very sturdy with lots of room for extra storage. It’s more gray than tan but works well for my color scheme. Another great quality piece at an even better price. 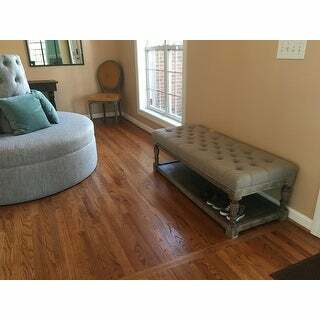 Overstock has surpassed my expectations on this beautiful bench. 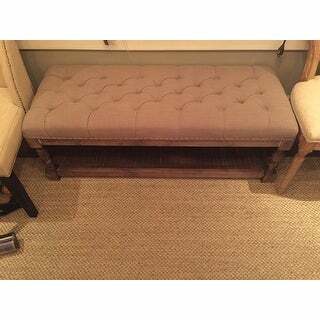 Great ottoman or bench. Quality and compact for use as either. Quality and compact for use as either. Beautiful finish on the base adds to the quality. "What is the return policy? As far as return shipping?" "Does anyone have photos of the color of the top? Current photos posted look like different benches ? " "What does the Manufacturer say the weight limit is?" The item has not been weight tested. 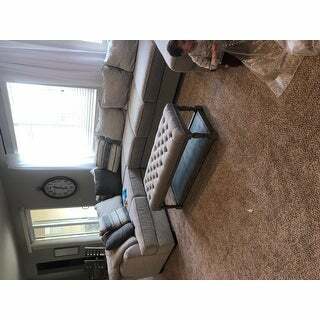 Fits with new bedroom furniture (purchased at Overstock), will provide additional seating and storage for guests. It blends with my current furniture and looks like it's a great quality piece. "Hello, Is it possible to estimate the shipping costs to Belgium ? Thanks. Regards,"
"Could this be used as an ottoman/coffee table?" "Just curious what the manufacturer part number is for this particular bench?"